Trish Knits.com – If You’re Cold, Put On a Sweater; That’s What They’re For. You are here: Home / blog / If You’re Cold, Put On a Sweater; That’s What They’re For. If You’re Cold, Put On a Sweater; That’s What They’re For. This is going to be an exciting week for me. This weekend is the Maryland Sheep and Wool Festival, which is my second-favorite event of the year, next to Christmas. In fact, this week is kind of like that week in 1979, when I had the chance to see both of my favorite bands in concert in the same week. (Ok, I know you’re going to ask; it was the Bee Gees on a Monday and Little River Band on a Thursday.) And on Monday? I had the chance to finally meet the creative force behind my favorite knitting podcast–Brenda Dayne of Cast On. 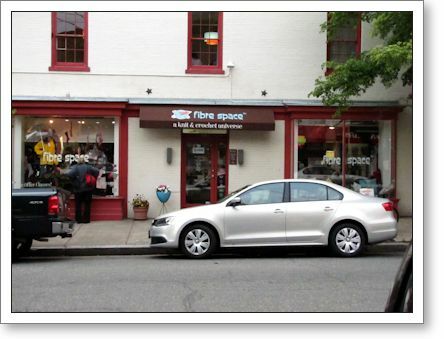 The event was held at Fibre Space in Alexandria, VA. I was afraid that I would not be able to attend the event because the store is in a section of Alexandria known as “Old Town,” old being the operative word. A lot of shops and buildings there date back to colonial times and much of it is not wheelchair friendly. 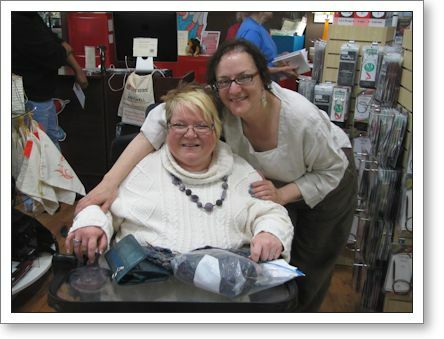 Such was the case with this yarn shop when I called to inquire, but a couple of days later, the owner, Danielle, called to say that she needed a push to go ahead and buy a portable ramp for her front step. I’m glad I could be it. So I owe a huge THANKS to Fibre Space for understanding my need and filling it. Believe me, if I lived closer to that shop I’d go all the time. 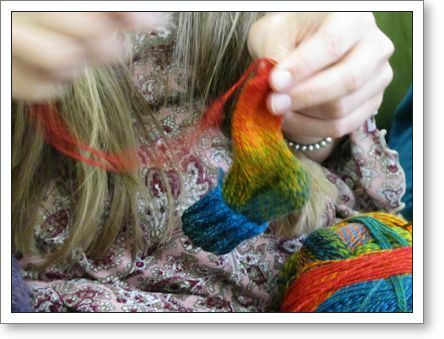 The atmosphere is cozy and kitschy, the staff is friendly and helpful, and the yarn? Oh my. Gorgeous. Even though I was there to see Brenda, there were quite a few things that decided to come home with me. More on that, later. 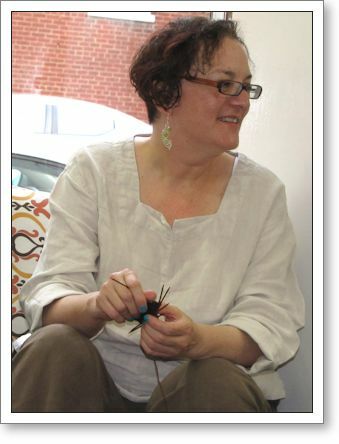 Brenda Dayne, knitting a sock! Brenda Dayne is the host and creative force behind Cast On, which is my all-time favorite knitting podcast. The show’s been running since 2005, believe it or not, but I picked it up in 2007 when I got my first iPod. Her delivery is smooth and professional, conversational and informative. I have every episode saved on my iPod and when the rainy days hit, Cast On, knitting and a cup of my favorite cinnamon stick tea are the perfect antidote to grey weather blues. It turns out that along the way I discovered that Brenda and I had a couple of interests in common. We both started using WordPress as a blogging platform at about the same time, and for a while, at least, we used the same theme. (We’ve since outgrown it, I think, but it served us both well for quite a while.) So, it was fun to compare notes on our tweaks. That, and there were emails about other things, LOTS of other things over the years. So, I was excited when we finally had the chance to meet. 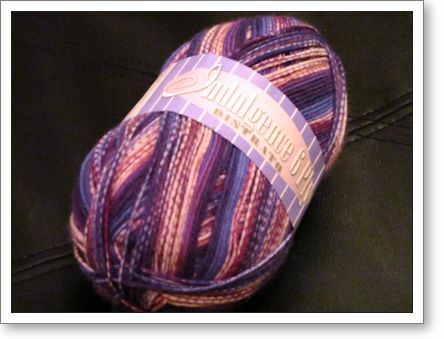 Someone named Katie was working on a pair of teeny-tiny newborn socks using a rainbow-colored Zauberball. While she was there she finished the first sock and made excellent headway on the second. That is one lucky baby to get some brightly colored socks! 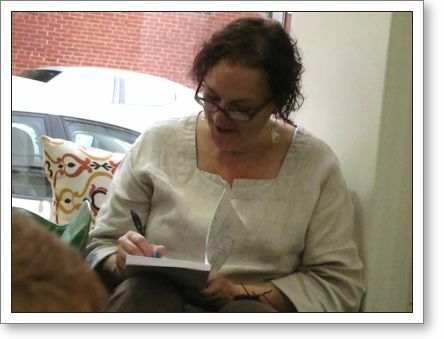 The reason for the gathering was a book signing for the book, What Would Madame Defarge Knit? by CraftLit podcaster Heather Ordover, in which Brenda has a featured pattern. Sadly, I didn’t get a copy of the book for myself that night, but now I wish I had and may do so in the future. The Crafter’s Tool Butler by Jordana Paige, is almost an answer to a prayer. Aesthetically, it beats my ugly old worm binder, so I won’t be embarrassed to take my spare knitting needles on the occasional field trip to knit group. 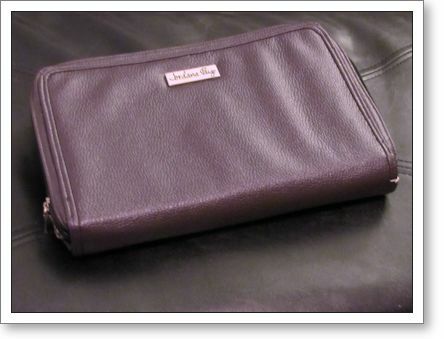 In fact, the thing looks very versatile, and as an added bonus, it comes in purple! But alas, it’s nearly 2:00 in the morning and I’m headed to the Sheep and Wool Festival after breakfast. So, I’d better stop for now. Besides, this thing deserves its own blog post. Really. Yay, Trish – glad they were able to accommodate you – they are a pretty awesome staff there. I REALLY like that shop, and the same keychain found it’s way home to me from there as well – came in very handy just the other day, because I kitchener’d and then wove in the ends with the same tool. Awesome! It’s great you were able to go to this event. I’m so jealous, I wish so much Brenda would come in Paris one day.